How does two-and-a-half days full of genealogy education in a setting packed with history, great music, and world-famous BBQ sound? 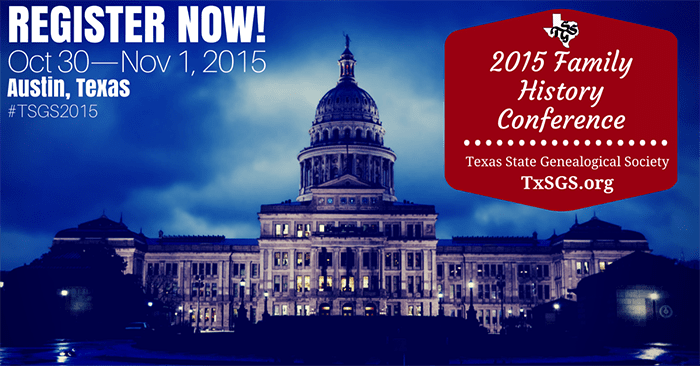 Join me next month at the 2015 Family History Conference in Austin, Texas! The Texas State Genealogical Society is hosting its annual Family History Conference from October 30th through November 1st at the Crowne Plaza Austin, just a ten minute drive from the Texas State Library and Archives. The schedule is packed with tracks focusing on: introductory topics, libraries and archives, societies and communities, digital genealogy, adoption, DNA, Hispanic research, methodology, record sets, historical context, African American research, courthouse records and record loss, and land and country. Saturday and Sunday mornings feature keynote talks by J. Mark Lowe and Lisa Louise Cooke. Daily optional add-on workshops provide more in-depth teaching by Lowe and Cooke, as well as two workshops on intermediate and advanced DNA. Friday afternoon’s program will be of particular interest to my fellow library professionals. If you are attending, I would love to see you at one or both of my sessions! Help your patrons take their genealogy to the next level by assisting them with archival research. Texas and the southwest region are rich in original records pertaining to the Spanish, Mexican, Republic, territorial, and statehood eras. Learn about key finding aid portals to locate specific repositories and collections to visit in-person, as well as key portals to consortia-shared digitized collections that can be accessed online for free. Not an archivist or special collections librarian? No problem. We will briefly cover key archival terminology before a walk-through of how to search, browse, and analyze these finding aids and digitized collections. Already working with or have expertise in archives and special collections? Learn about valuable tools for helping library staff and patrons understand archival research, plan a visit to a repository, and cite archival materials. We will also discuss how your library can contribute its finding aids and digitized collections to these types of collaborative portals, and take a look at coordinating or participating in an archival crawl as a community outreach and marketing activity. The long history of formalized record keeping in New Spain and Mexico provides a wealth of information for researching those ancestors. But these records cannot be of help unless one knows the right place to start looking. This introductory lecture will cover key U.S. and Mexico records for identifying your Mexican immigrant origins and ancestors, explain how Mexican naming conventions can play a role in finding those records, and will highlight the types of genealogical information that can be gleaned from those records. Colleen (Robledo) Greene’s father was raised by his Mexican immigrant grandmother. When Colleen started researching this part of the family history 16 years ago, there were no living family members who knew from where the family originated, or how or when the family immigrated. Living family only knew the name of one great-grandparent. Colleen—who does not speak or read Spanish—hit one brick wall after another. This year, however, those brick walls have come crashing down. Colleen will explain and demonstrate the sources and techniques that have brought her success. Ohhh… I’m so excited. I am planning on attending your class as I posted on my blog http://patientgen.blogspot.com/2015/10/making-plans-for-texas-state-genealogy.html. I have a sister-in-law from Monterrey, Mexico and I have folks that I work with at church with Mexican Heritage. I’m really looking forward to getting my feet we.